In this master project, which I have done externally at DNV-GL, I have built a recommender system for knowledge portals. Recommender systems are pieces of software that provide suggestions for related items to a user. My research focuses on the application of a recommender system in knowledge portals. A knowledge portal is an online single point of access to information or knowledge on a specific subject. Examples of knowledge portals are SKYbrary (www.skybrary.aero) or Navipedia (www.navipedia.org). 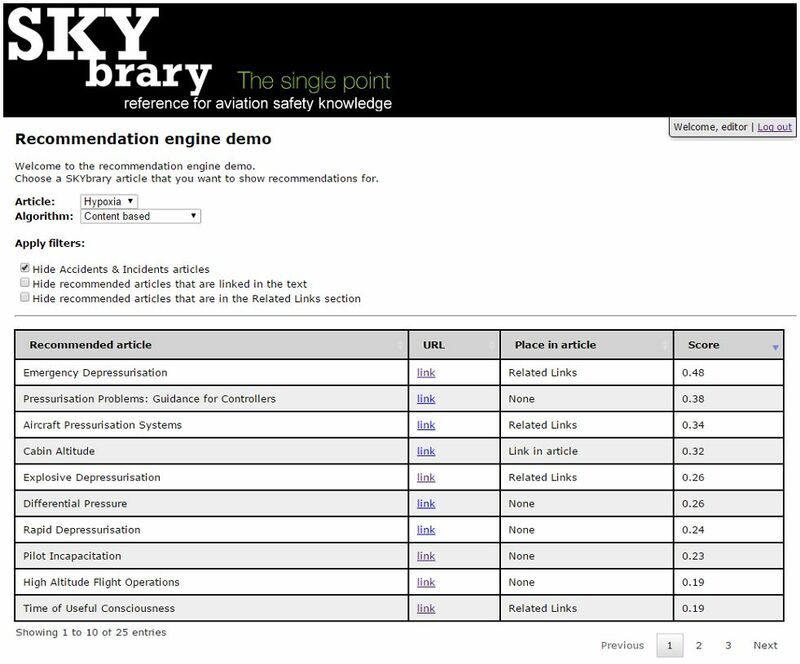 Part of this project was a case study on SKYbrary, a knowledge portal on the subject of aviation safety. In this project I looked at the types of data that are typically available to knowledge portals. I used user navigation pattern data, which I retrieved via the Google Analytics API, and the text of the articles to create a user-navigation based and a content based algorithm. The user-navigation based algorithm uses an item association formula and the content based algorithm uses a tf-idf weighting scheme to calculate content similarity between articles. Because both types of algorithm have their separate disadvantages, I also developed a hybrid algorithm that combines these two. To see which type of algorithm was the most effective, I conducted a survey to the content editors of SKYbrary, who are domain experts on the subject. Each question in the survey showed an article and then recommendations for that article. The respondent was then asked to rate each recommended article on a scale from 1 (completely irrelevant) to 5 (very relevant). The results of the survey showed that the hybrid algorithm algorithm is, which a statistical significant difference, better than a user-navigation based algorithm. A difference between the hybrid algorithm and the content-based algorithm was not found however. Future work might include a more extensive or different type of evaluation. In addition to the research I have done on the algorithms, I have also developed a demo application in which the content editors of SKYbrary can use to show recommendations for a selected article and algorithm. For more informaton, view Roy Hoeymans’ Thesis Presentation [pdf] or read the thesis [Academia].